On the Edges of Vision. 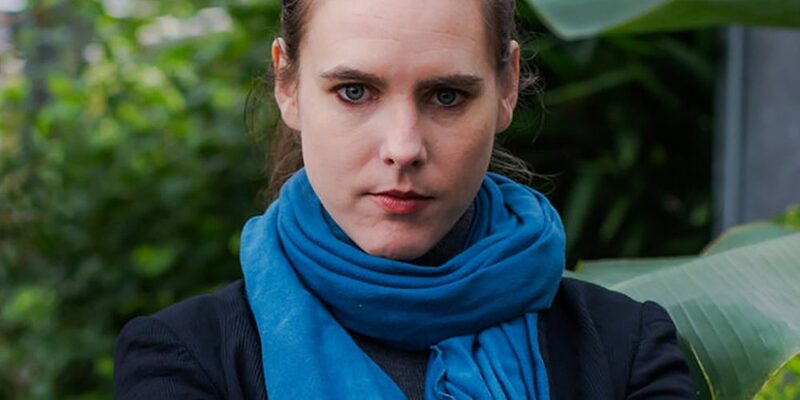 It’s hard to pinpoint exactly what makes a short story by Helen McClory so distinctive, but without fail you’ll know it when you find yourself reading one. McClory has been mining her own particular patch of territory for almost five years now, traversing the terrain between fabulism and domestic drama, surveying the stuff of folklore and mythology and weaving it into serious fiction with vivid imagery and poetic flair. 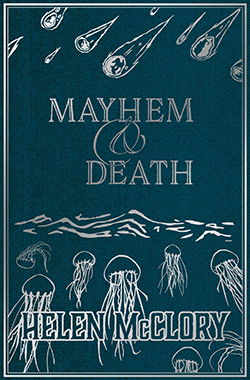 Earlier this year, the publication of her second collection of stories, Mayhem & Death, was accompanied by the republication of her first, On the Edges of Vision (2015), and the two collections work in concert to give readers a more expansive sense of McClory’s inventive world: its breadth and contours, its alternately whimsical and sinister atmosphere, and its uncanny rules. 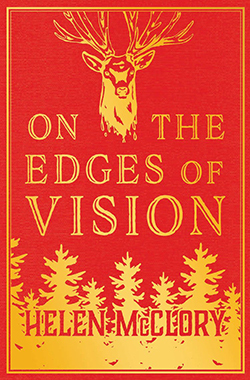 On the Edges of Vision won the Saltire Society’s First Book of the Year Award when it originally appeared in 2015, even though it was published by a small press based in Plano, Texas, half a world away from the Saltire headquarters in Edinburgh. 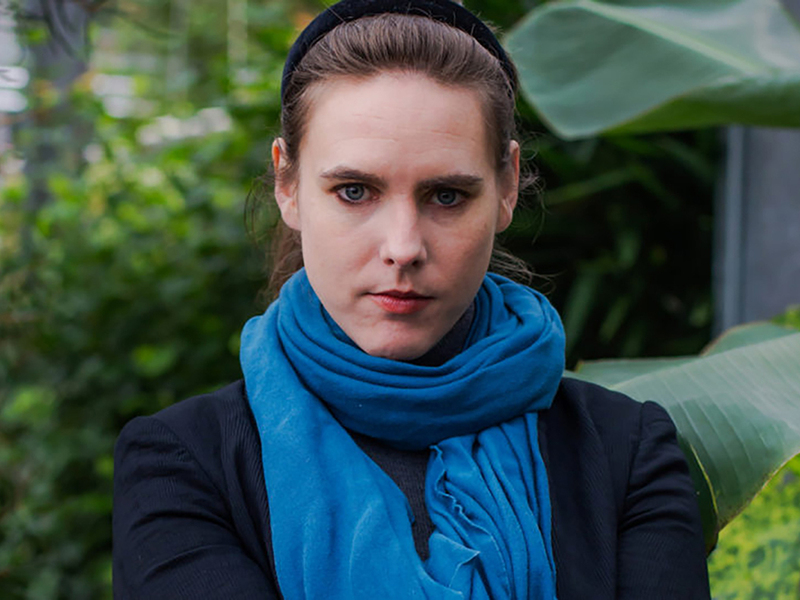 McClory followed it up with a novel, Flesh of the Peach, in 2017, and around the time of the novel’s release she began to develop a profile for her innovative use of social media, her advocacy efforts on behalf of unjustly neglected writers, and her embrace of literary initiatives beyond the limits of the printed page: for instance, far from seeing an opportunity to be frivolous or superficially entertaining, she responded to a writing exercise on the Paperchain podcast with an improbably tender series of vignettes about Jeff Goldblum. None of these details are incidental to McClory’s work. As she told the interviewer Ali Braidwood of Scots Whay Hae!, the fragmentary nature of social media gives her stories their length and shape, and the folkloric and mythological elements of her stories are tinted by their prior representation in media of all varieties. McClory’s wild cast of characters includes a cyclops, the offspring of an incubus and a succubus, mermaids, witches, monsters, hags, ghosts, a human sacrifice from Ancient Greece, Vestal Virgins who have outlived their time, a vampire who is afraid of blood, and — twice — the devil. Her set pieces involve portals to other planes of existence, portents of apocalypse, books of ancient lore, charms, spells, the resurrection of ancient evil, and so on. Sensationalism is the lifeblood of McClory’s stories, but here’s what gives the stories their pulse: although they fall into genres like fantasy, mystery, and horror, they don’t contribute to those genres in good faith. Rather, they shine a light on the pervasive bad faith of popular stories that indulge the worst excesses of genre conventions — and the light they shine is stark and unforgiving, like the fluorescent glare that pierces the eyes of a squirming suspect under police interrogation. a little clumsy with her limbs not moving right and her blue-black blood slowshot through them. She hasn’t opened her eyes yet; they’ve been closed that long she has to pry the lids apart with thick fingers, prop them open a while, practice her blinks. Though her sight is keen, and if there were anyone here, they’d see eyes of a glorious brightness, clear like something raised on fish and chilled glacial water. God, she needs a cigarette. Clothes first. You want the wrong things. The camera glories in the horse at full gallop through russet woods. And on its back you the bride in white, urging onwards. Hoof beat, snapped twig, threshing sounds of the undergrowth. Music swells and the branches of the trees catch at your veil, and you are every heroine of romance, ripping loose her stitches to get out of the picture. Into the open field. No more compulsive acquiescence. No more smiling on cue. No more men standing too close explaining how to exist, believing, if left to your own device, you’d not quite manage such a feat. You want the wrong things. You resist, you run. There’s an echo of this story, too, in ‘I Was At Last a Romantic Comedy About Corruption and Decay’, as the characters from a comedy emerge from a cinema screen after having watched a movie about the audience, and there are even several stories written explicitly in response to films ranging from Practical Magic (1998) to Stoker (2013). So, then, what is the nature of the territory that McClory has spent the past few years mining? Although it extends across regions of the fantastic and the supernatural, and although it is populated in a sometimes metafictional sense by characters who chafe against its boundaries, its bedrock is familiar, quotidian: dig down deep enough and what you’ll find are classic novels, celluloid, memes, box sets, a whole substrata whose common element is the ubiquitous entertainment that slicks the surfaces of our culture. Offering more than seventy stories across her two collections, including the novella ‘Powdered Milk’ that brings Mayhem & Death to an unforgettable conclusion, McClory hits the high notes time and time again. Ultimately, it’s impossible to say that Mayhem & Death is quantifiably better than On the Edges of Vision or vice-versa. The two books were published so closely together, and are so much of a piece, that even though the more recent volume shows a greater assuredness of style, the lion’s share of both volumes is impressive and each one has its standout stories. Because McClory tends to write flash fiction, keeping her stories to fewer than three or four pages, she often dispenses with sequences of events in favour of simply describing a situation. But her situations are riven with sublimated absurdities, and her descriptions show how those absurdities can erupt into fully-fledged problems that defy resolution within the confines of her chosen form. ‘Pretty Dead Girl Takes a Break’ typifies McClory’s aesthetic strategies. At first, the dead girl’s return to life is absurd, even a little comic. As the story progresses, her revivification becomes a vehicle for indignation at the violence inflicted on her for the purposes of mass entertainment. But the prose has a tenor at odds with both of these things — it is finely honed, studiously composed, level-headed, serious — which allows it to achieve two contradictory aims, simultaneously. On the one hand, it illuminates the moral depths of the situation which entertainments shy away from, foregrounding the visceral experience of brutality that is elided in conventional treatments of the dead girl archetype. On the other hand, it corrodes the story’s moral righteousness by solemnly doubting whether any brutalisation of such a woman can be justified, whether any fictionalisation of brutality doesn’t somehow render violence palatable, including, of course, the sufferings of the pretty dead girl in ‘Pretty Dead Girl’. McClory, then, is an enormously entertaining writer — preying, as she does, on the narrative conventions mass entertainments — as well as one whose stories are doubly reflective: even as they pry open emotional spaces so often sealed off in their more conventional sources, they provoke readers to wonder whether there’s really anything morally elevated about them. All of this is a roundabout way of saying that McClory is basically a postmodern writer, drawn to subverting and revising the lazy moral norms of conventional activities and art. But it’s also to say that McClory is a postmodernist with a twist: she shirks some of the postmodernists’ favourite tools, particularly pastiche and irony, so that she skewers her targets without giving in to the temptations of overheated zaniness and flippant self-deprecation. As contradictory as this may sound, her stories are formally playful in a sober and serious way. Even when they opt for rather explicit metafiction, they aim for something more than imprisoning the reader in a hall of mirrors: ‘Ipseity’, for instance, sort of lifts its premise from Toy Story (1995), but it ends with a collapse of storytelling that aims to reveal the brittleness of the premise itself, and ‘Mary Somerville’s Celestial Disruption’ is structured around a refrain — “This did not happen” — which doesn’t destroy the believability of events so much as it begs us to ask whether characters who exist only as concepts can be said to have a stake in our reality. Elsewhere, McClory flips the schema, applying lyrical realism to subject matter that is neither realistic nor worthy of lyricism, with effects from the playbook of David Lynch. ‘Pretty Dead Girl Takes a Break’ is an example of this technique at its most prosaic. In its more extreme forms, it results in nightmarish stories like ‘The Expectation of a Job Well Done’, ‘Nostalgia Tremens’, and ‘A Common Enough Thing’. A man inexplicably dissolves his body, limb by limb, in an acid bath. A calm, caring woman voluntarily submits herself to a mauling by a dog. A googly-eyed sandwich shop mascot — a human being in a sandwich costume — becomes, literally, a walking sandwich. And when the nightmarish tone of these stories is applied to a patently absurd scenario, a scenario so plainly bizarre that the realism seems wholly inadequate to the strangeness of what is being described, McClory reaches some of her highest heights. There are few moments in these two volumes that surpass the sprouting of leaves from a young girl’s eyes in ‘Unspoken’, or the complaints of horny sea maidens without genitalia in ‘Sexually Frustrated Mermaids’. Or the pop star Lana del Rey outing herself as a professional hunter of monsters in ‘Atomised Ride’. Or the insects living in the desecrated image of a human face in ‘Trypophobia’, an exceptionally powerful story about the planning of a mass shooting. Because she’s so plugged into social media, McClory must know, better than most people, that a lot of writers today manage to generate activity on social media even though their published work has all the lasting value of yesterday’s tweets. But McClory’s activity is no mask for a lack of talent, skill, or novelty. Both On the Edges of Vision and Mayhem & Death contain their share of comparatively underwhelming stories, but those stories are a distinct minority, fewer than one in ten, while the remainder announce the arrival of a writer whose preference for brevity belies the scale of her ambitions. Together, the two volumes make it clear that McClory has a powerful voice and a critical gaze that furnish her with many things to say, and, more importantly, that she is driven by a keen intellect in search of ever new and surprising ways to spin them into art. That she has continued to publish prolifically in the months since the release of these books is a welcome sign of what the future holds: a portent or precognition, true to her own inclinations, of those sparks of magic that might settle upon the pages of a collection to come.